Author: Riikka Halme. Series edited by: Wilfrid H.G. Haacke. 12 pp. Roman, 299 pp. Kwanyama – Oshikwanyama according to the official Namibian standard – is a Wambo language, and correspondingly belongs to the Bantu languages. It is spoken by far more than half a million people in South Angola and Namibia. Certainly this number includes the speakers of other closely-related Wambo varieties in Angola. These languages have been studied relatively little, and the study of their tonal systems has been particularly neglected. 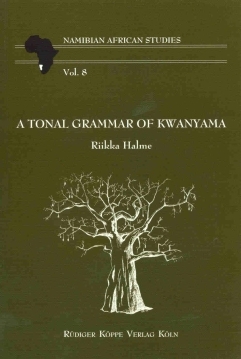 The present book is the first sketch of Kwanyama grammar with a systematic account on tone. The main aim is to provide an analysis of the tonal system of this language. Therefore the study discusses both the lexical tone, i.e. tone as an inherent property of a lexeme, and the grammatical tone wich marks grammatical properties. The author lived in a Kwanyama speaking community in Angola for about half a year and had the opportunity there to improve her linguistic competence. As a researcher she keeps to the tradition of Generative Phonology in the sense that there are rules that take the tone patterns from the underlying representation to a binary surface representation, i.e. tonemes. In order to help the reader to follow the argumentation of the tonal analysis, this book is organised in such a way that the segmental and tonal levels are discussed separately, followed by discussions on tone in nouns, verbs and minor word categories. After that, the study is related to the wider context of research on Guthrie’s group R languages, especially the Wambo languages. Finally, the reader finds nominal and verbal paradigms as well as some texts, and a vocabulary Kwanyama-English comprising about 6,000 entries.